Chrissi's Scrappy Space: White with 1 May challenge. White with 1 May challenge. This month was no different with this fabulous colour. Now with 2 boys and a man child husband, I don't use feminine colours much. But I took the plunge and gave it a go- I had nothing in the way of embellishments in this colour either lol. But I love my multimedia, so out came the modelling past and distress stains. I recently acquired picked raspberry so it was perfect. 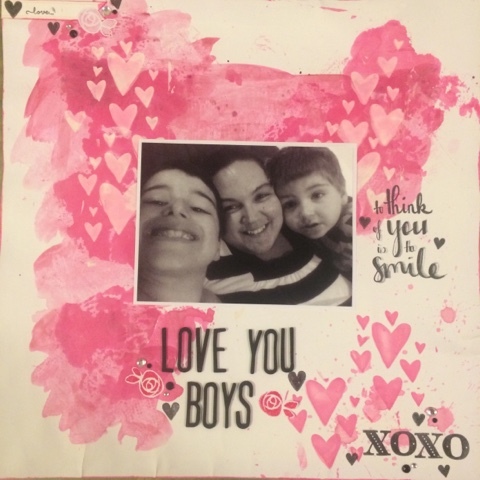 I even managed to use a pic of myself and my 2 boys. I turned it black and white and was very happy with the way it came together. This looks wonderful Chrissi.. love the hearts in the back ground color.. thanks for joining in with White With One this month..
Love your background, great page. Thanks for joining in with us at WW1. Lovely layout! Thank you for playing along with us at White with 1! Pickled Raspberry saved me too! Love your page - glad you got to go feminine! Thank you for joining in at White with 1!